About company | Belet a.s. The joint-stock company Belet a.s. arise in the year 1992 by privatization of the company Belet s.p. 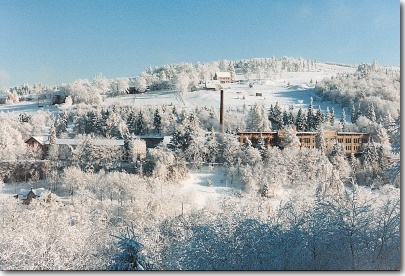 Main production and office buildings are situated near Vejprty, that is in the west side of mountains Krušné hory, near the border with Germany. Historically tradition in this region is a light engineering production, tool engineering and among experts are knows and highly reputable hunting weapons, comes from this region. An advance for this export company is that the most of population, so also workers, speaks bilingually – Czech and German. The turning point at work of the original company was the displaced of the German population after World War Two. Armament industry wholly defunct, other productions were inhibited. Engineering activity, already under the name Belet – county industrial company, was regenerated in the sixtieth and seventieth years. The company step by step began focusing to engineering production in field of handling technique. Despite of, that it comes of manually operated handling equipment, these products won repute and acknowledgement not only in the Czech republic, but in the seventieth and eightieth years becomes, during foreign trade companies Merkuria and Strojexport, to be a export subject to West European lands. Main customers were at this time German and Italian companies, which some are business partners to date. Since 1993 succeeded to consolidate the company and use the economical environment to provide stability and economic growth. To strategic aspiration, which were realized at this time, belong especially to create an inland and foreign business and service net, export of products on the East markets, to win the quality certificate ISO 9001, to create a whole product range of handling technique. Record of a high technical and manufacture workers skill of Belet a.s. to introduce the traditional production of hand hunting weapon under historical trademark “Weipert”. One of the last strategic concept was accepted in the year 1997 and consist of introducing of fork lift engine trucks, so product assortment in Czech republic traditional produce and sell by company Desta a.s. At the end of 1997comes to introduce of license manufacturing fork lift trucks, step by step replaced by products of own development.